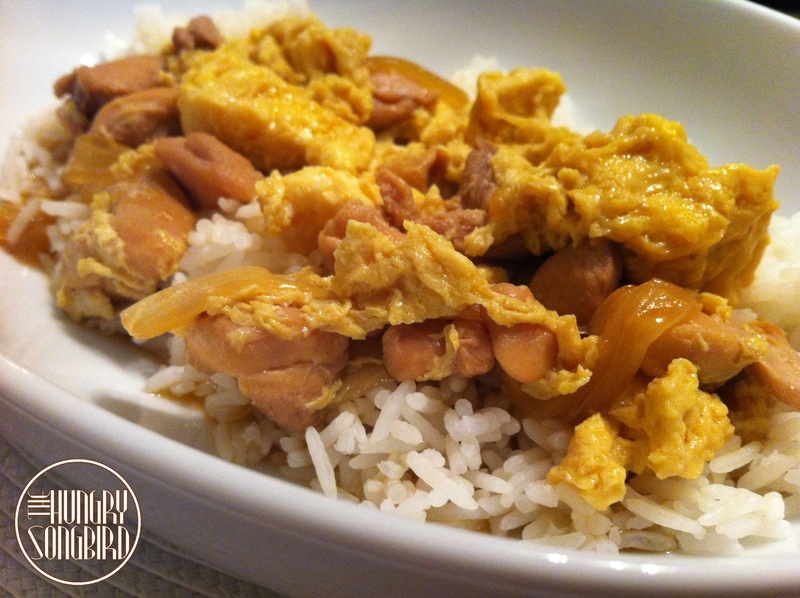 Oyakodon is a traditional Japanese rice bowl topped with simmered chicken, onions, and egg. This is one of my father's all-time favorite meals, so I try to make it for him frequently. He describes it as, "Japan's version of meat and potatoes - it's a country-style dish." This recipe is so delicious, and deceivingly easy to make! Place the chicken in a nonstick skillet with a lid, and cook and stir over medium heat until the chicken is no longer pink inside and beginning to brown, about 5 minutes. Stir in the onion, and cook and stir until the onion is soft, about 5 more minutes. Pour in the stock, and whisk in soy sauce, mirin, and brown sugar, stirring to dissolve the sugar. Bring the mixture to a boil, and let simmer until slightly reduced, about 10 minutes. Whisk the eggs in a bowl until well-beaten, and pour over the chicken and stock. Cover the skillet, reduce heat, and allow to steam for about 5 minutes, until the egg is cooked. Remove from heat. To serve, place 1 cup of cooked rice per bowl into 4 deep soup bowls, top each bowl with 1/4 of the chicken and egg mixture, and spoon about 1/2 cup of soup into each bowl. You will probably be sorry that you didn't double this if you're cooking for more than 2 people, so keep this in mind! ;) Enjoy! Copyright © 2012. The Hungry Songbird. Awesome Inc. theme. Powered by Blogger.